#1 Indiana 83, #14 NORTH CAROLINA 59 - The 14th ranked Tar Heels (5-2) had their hands full against the top ranked Indiana Hoosiers (7-0) trailing by nine at the half. Then they started the second half going 1-20 from the field...Game over. 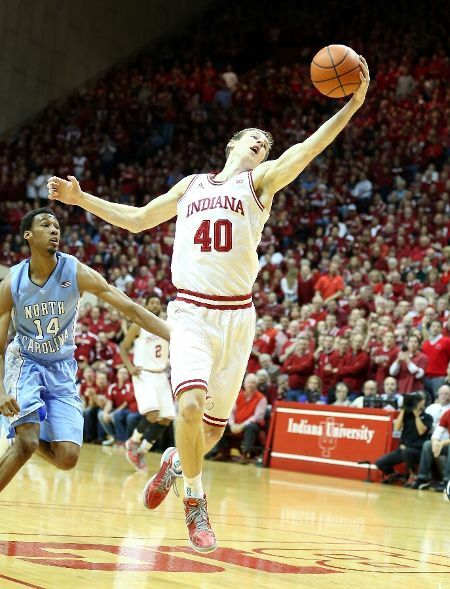 Cody Zeller finished with 20 points and eight rebounds, and Victor Oladipo and Will Sheehey both added 19 points, leading the top-ranked Hoosiers to a stunning rout of UNC in the ACC/Big Ten Challenge. The Tar Heels opened the second half going 1 of 20 from the field and got their only basket on a tip-in that may have been deflected off the hand of an Indiana player. Zeller was 8 of 13 from the field with four blocks, one steal and an assist. Oladipo and Sheehey were both 8 of 12 from the field. Senior guard Jordan Hulls was 5 of 8, including three 3-pointers, and finished with 13 points, eight assists and two steals. Dexter Strickland led the Tar Heels with 14 points, Marcus Paige had 11 and James Michael McAdoohad 10 points and nine rebounds for North Carolina, who was missing sophomore guard P.J. Hairston, who stayed home with a sprained left knee. Recap. VIRGINIA TECH 95, Iowa 79 - Erick Green scored 16 of his game-high 24 points in the second half to pace five players in double figures as the Hokies rolled to an eye-opening nonconference victory over Iowa in an ACC-Big Ten Challenge game at Cassell Coliseum on Tuesday night. With the victory, Tech moved to 6-0 on the season. 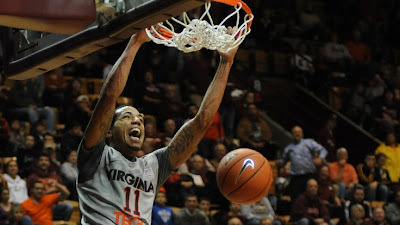 The Hokies last won their first six games to start a season in 1982. Tech also moved to 3-5 all time in the ACC-Big Ten Challenge - with all three victories coming over the Hawkeyes. Recap. MARYLAND 77, Iowa 57 - Dez Wells set a career high with 23 points as Maryland blew out Northwestern in the second half en route to a win on Tuesday night. 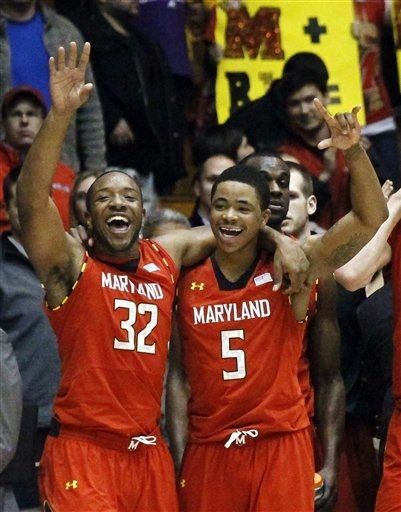 Maryland (5-1) led 28-26 at halftime but broke the game open in the second half, scoring on its first 10 possessions. The run stretched the lead to 47-34. 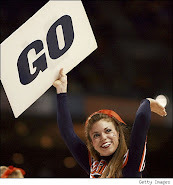 Wells hurt the Wildcats (6-1) from all spots on the floor, slashing to the basket and stepping back to hit jumpers. He was 9 for 11 from the field with three assists. Reggie Hearn had 19 points and Dave Sobolewski 14 for Northwestern, which was denied a fifth straight ACC/Big Ten Challenge victory. Recap. #3 Michigan 79, #18 N.C. STATE 72 - Trey Burke went the entire first half without scoring - and may have still been the best player on the court. The Michigan guard was setting up his teammates, and by the time Burke made a few shots of his own, the Wolverines were well on their way to another impressive victory. Burke finished with 18 points and a career-high 11 assists without a turnover, and No. 3 Michigan held off a late rally by No. 18 North Carolina State in a 79-72 win Tuesday night. Freshman Nik Stauskas led the Wolverines with 20 points and Tim Hardaway Jr. added 16, but it was Burke who controlled the game, equaling his previous career high of nine assists in the first half. N.C. State (4-2) trailed 73-58 before going on a 10-0 run capped by T.J. Warren's layup with 2:11 remaining. Hardaway answered with a driving bank shot. Recap. #21 Minnesota 77, FLORIDA STATE 68 - Joe Coleman scored 16 points, Rodney Williams added 14 as Minnesota beat Florida State on Tuesday night in the ACC/Big Ten Challenge. Minnesota (7-1) led 38-25 at halftime and by as many as 21 points in the second half. The Gophers' lone loss was to No. 2 Duke in the Battle 4 Atlantis. Recap. Nebraska 79, WAKE FOREST 63 - The Cornhuskers shot 62 percent in the second half to pull away from Wake Forest on Tuesday at Joel Coliseum in the ACC/Big Ten Challenge. The Demon Deacons (3-3) led by as many as four points in the first half before the Cornhuskers (5-1) took a 28-24 lead into halftime, but Nebraska came out firing in the second half to put the game away. Madison Jones led the Demon Deacons with a career-high 14 points on 6-of-9 shooting, and Codi Miller-McIntyre finished with 11 points and a team-high three assists.